The Vineyards has a strong social tradition begun years ago by the early residents of the neighborhood. Dubbed the "Friday Frenzy" is is a wonderful gathering of HOA residents to share food and fun marking the end of yet another busy week. A family volunteers to "host" a week by providing a main dish that they either prepare themselves, or buy prepared and bring it to the clubhouse. All attending neighbors then bring a side dish or desert of their choice for all. There ends up being plenty for everyone! All HOA members and their immediate families are invited and encouraged to attend these wonderful events. During the Summer the pool hours are extended so that all can fully enjoy the evening and more of the wonderful amenities the Vineyards provides. Why not sign up to host an event now? To do so please contact Diana Skelton / Danny Switzer by calling (903-2627) or emailing her - dskelton3@cox.net . Hosting A Friday Frenzy? Here is all you need to know! 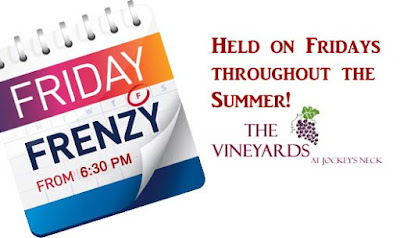 · It all begins by volunteering to host one of The Vineyards Friday Frenzys and to do so you sign up for an open date through Diana Skelton / Danny Switzer (phone – 903-2672). o ICE for beverages (3 or 4 10 pound bags are usually sufficient). · The Hospitality Committee will provide the condiments (which are on the shelves in the coat closet or in the refrigerator), Soft Drinks/Juice Boxes/water and all paper products. · Plan on beginning your set up approximately 1 hour prior to the event you are hosting. You will need to ice down the soft drinks which should be placed in the tubs at the club house. Also prepare a bowl of ice for the bar for people you put in their drinks. · Set up the food serving tables with paper products. · Finally, check the thermostat in the club house so that the temperature is comfortable given the weather. o Lock the doors and return the key. · You will be reimbursed for your costs up to $200 for the event. Save all receipts and prepare a short note itemizing the costs and refer to the date and the fact that it was for a Friday Frenzy. Either mail or deliver the note and all receipts to Berkeley Realty and a check will be sent to you. Make sure you include your name and address. Further questions? Call Diana Skelton or Danny Switzer at 903-2672 they will be of tremendous help!